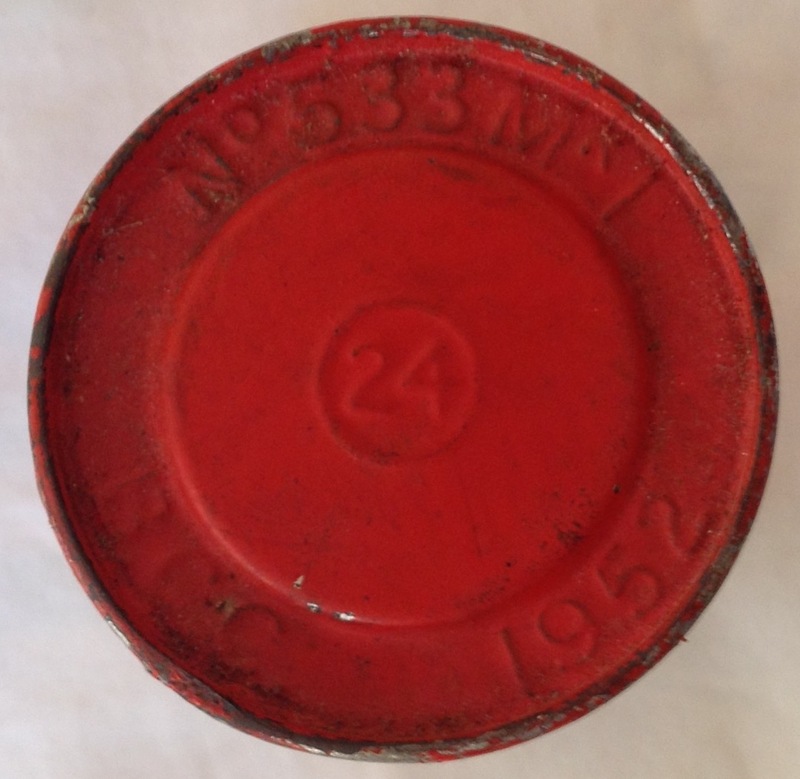 One of the very first objects I covered on the blog was the No36 grenade here. That example was in lovely condition and as such I have not really been looking for another example to add to the collection. Whilst on holiday in Scarborough however I came across an example that was so cheap I had to pick it up for the collection. This grenade is not in such nice condition and clearly needs restoring at some point, but is interesting in that it is clearly a drill grenade: The two obvious ways to tell that this grenade was for training are the large holes drilled in the body, and the remnants of white paint showing through under the gloss black: Drill grenades were to be painted white to clearly show they were free from explosives, as seen in this illustration from a 1960s manual on explosive markings: The grenades used for drill and practice models were those which had been rejected by the factory as unsuitable for actual use. The factory itself then drilled holes in the body and put them to one side. The rest of the grenade is completely standard to allow for realistic training, there is a large zinc base plug: The base plug is cast with the date of manufacture, 1945: Under the base plug is space for a dummy detonator to be fitted: Sadly this grenade is missing a correct fly off lever, a piece of wriggly tin sufficing for now. The rest of the components are present though and it can be stripped down: Going forward I would like to replace the lever with an original one and I want to strip and repaint the grenade back into white as it would have been in service. 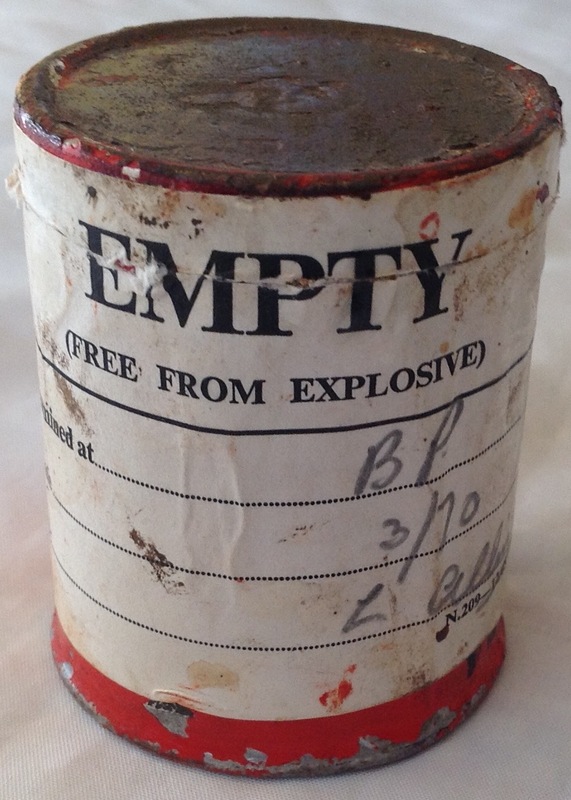 It would also be interesting to see if there are any markings on the body indicating who manufactured the grenade, any there might be are currently buried under the thick layer of paint. This entry was posted in British Army, Grenades, WW2 on September 13, 2018 by hatchfive. Over the last few years we have covered a number of pouches and a complete bandolier set up to hold 40mm underslung grenade launcher rounds. Tonight however we are looking at one of those 40mm rounds, an L8A1 practice round: Sadly I do not have the cartridge case for this round, just the projectile but I am sure the missing piece will turn up soon enough. Complete the rounds look like this: As this is a practice round, the head is blue to indicate that it is safe and free from explosives: The head does contain a coloured powder however to indicate where the round has impacted during training, usually in pink or orange. Whilst this is perfectly safe it is very messy so it is not advised that you try and dismantle a round. 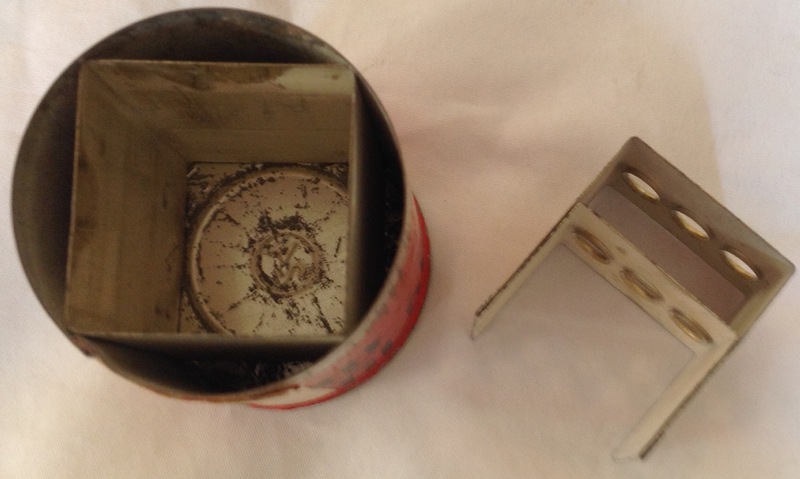 A rubber obdurating ring is fitted to the lower part of the round to help create a gas seal with both the cartridge case and the inside of the launcher: The round works by having a small high pressure cup inside the case holding the propellant, when it is fired this cup ruptures and the gas escapes into the rest of the casing where it expands and produces the low velocity needed to launch the grenade itself. The back of the grenade is slightly tapered and there is a circular void in the base which works with this cup to provide the thrust needed to propel it: Markings are printed in white on the outside of the practice round and indicate the size, 40mm calibre and 46mm long, that the round is a practice round with the designation L8A1 and that it was manufactured in February 2011: The size of this round is a common one used by many grenade launchers and is a low velocity round with a typical velocity of just 249 feet per second. These rounds are not hard to find and can be easily found for under £10 but are very attractive and affordable pieces of ordnance for a collection. This entry was posted in British Army, Grenades, Ordnance, War on Terror on August 10, 2018 by hatchfive. Today we are used to the idea of an underslung grenade launcher for the SA80, this has been used very successfully in conflicts for the past fifteen years. Before this was introduced though, the SA80 was issued with a rifle grenade that fitted over the muzzle of the rifle and was fired by a cartridge from the breach of the gun itself: To accompany this grenade, a special pouch was created as part of the PLCE webbing systems. Originally in olive green, this carrier was later produced in DPM: The original design was a full pouch, this DPM version though is just a skeleton pouch. Two white plastic cups in the base of the carrier hold the noses of the grenades: Two little lids are provided, one for each grenade: Straps underneath the lid help hold the tails of the rifle grenades secure: The pouches are designed to be used in a number of ways and so the back of them is very ‘busy’: A flap is provided on the back for a belt to pass through so the pouch can be worn on the belt: Under the flap are a pair of ‘T’ bar fasteners that lock into the belt of the PLCE system: Primarily however it was expected that a pair of pouches would be zipped to a bergan in place of one of the standard side pouches. In order to do this a heavy duty zip is fitted round the outside rear of the pouch: Fastex clips are also fitted to allow a shoulder strap to be fitted or to attach the pouches to the day sack yoke: This particular pouch dates back to 1997: The muzzle launched rifle grenade was only a short lived concept, the much smaller and more effective underslung launcher replacing it and rendering these pouches obsolete. As such they are readily available on the surplus market and a cheap addition to the collection. This entry was posted in British Army, Grenades, PLCE Webbing, Post WW2, Webbing on March 9, 2018 by hatchfive. There are certain items of military equipment that are fundamentally good designs and last in service for decades- the Mills Bomb and Lee Enfield rifles being two examples of this. Another long lasting design was the No83 smoke grenade. 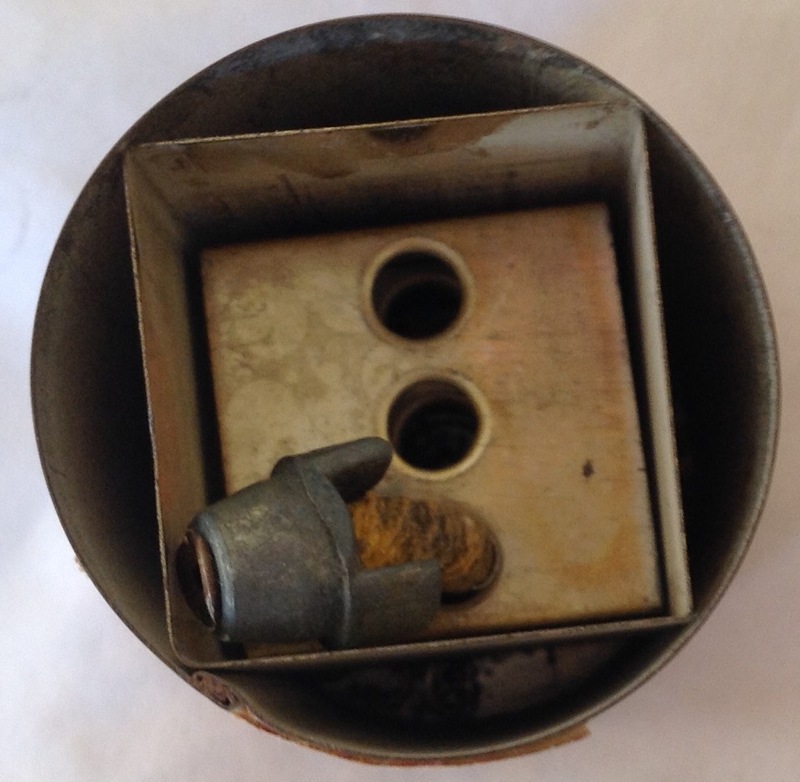 This smoke grenade was designed during the Second World War and is a pressed metal cylinder with a ‘fly off’ lever type igniter: The original No83 grenade used a friction match type striker mechanism: This was replaced by the MK II in February 1944 which has the striker mechanism that screws into the top and used a spring and pressed metal handle: The handle is made from one piece of metal, stamped and folded into shape: The grenade was very easy to use, a safety pin was pulled out and when hand pressure was released from the metal handle an internal spring threw the handle off and set off the fuse: The smoke grenade came in four colours; red, yellow, green and blue and smoke was emitted for between 25 and 45 seconds through a hole in the base of the grenade: There was a four second delay before the smoke was emitted allowing the grenade to be thrown into position. 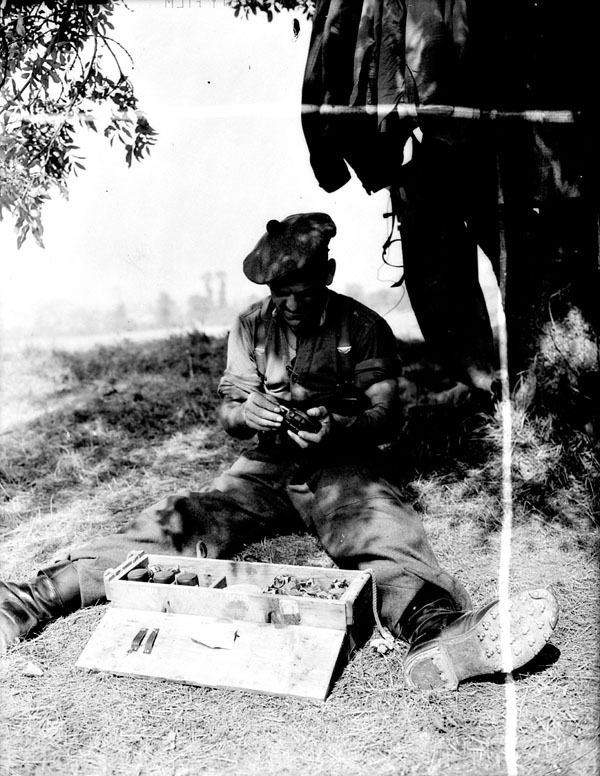 Grenades were issued in a B166A ammunition box that carried 24 of the grenades, weighing in at a hefty 47 lbs. 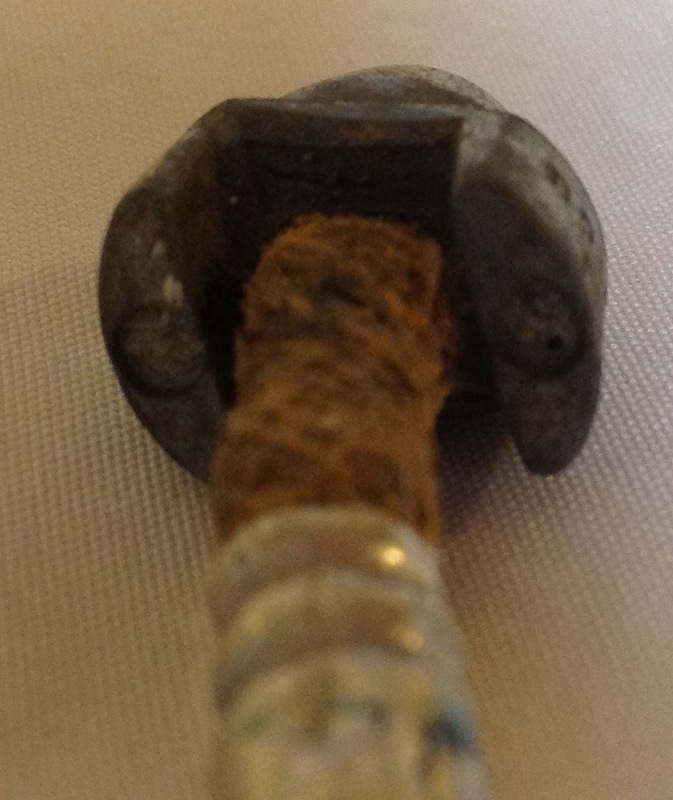 This grenade is extremely worn and has virtually no external paint left. What is left is an apple green colour indicating this is a post war example- the type remained in use up until the 1970s. 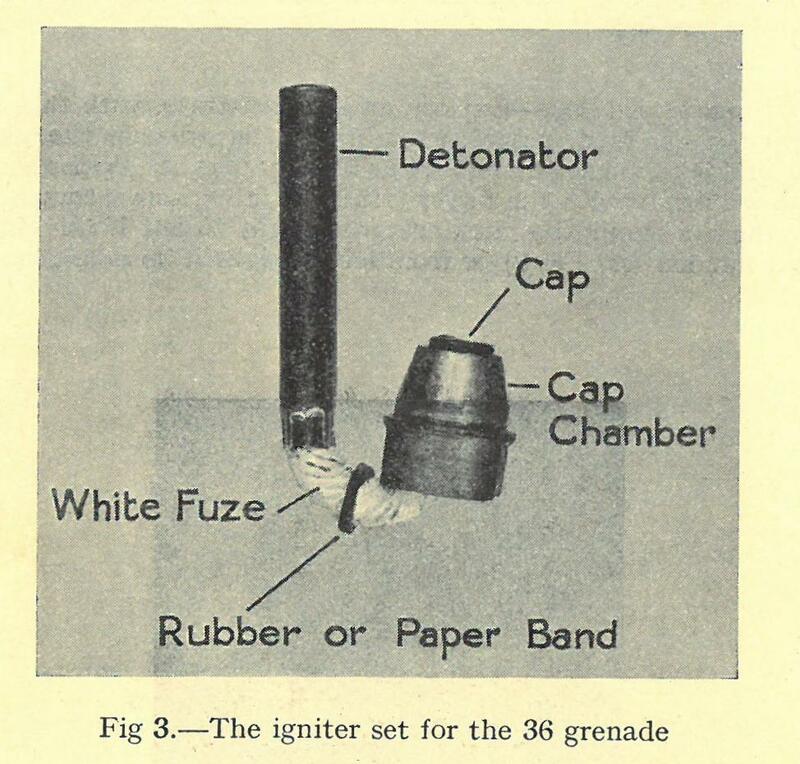 This design was very successful and set the basic design of a smoke grenade up until the present day- look at the modern smoke grenades I posted here and the design lineage is very clear. 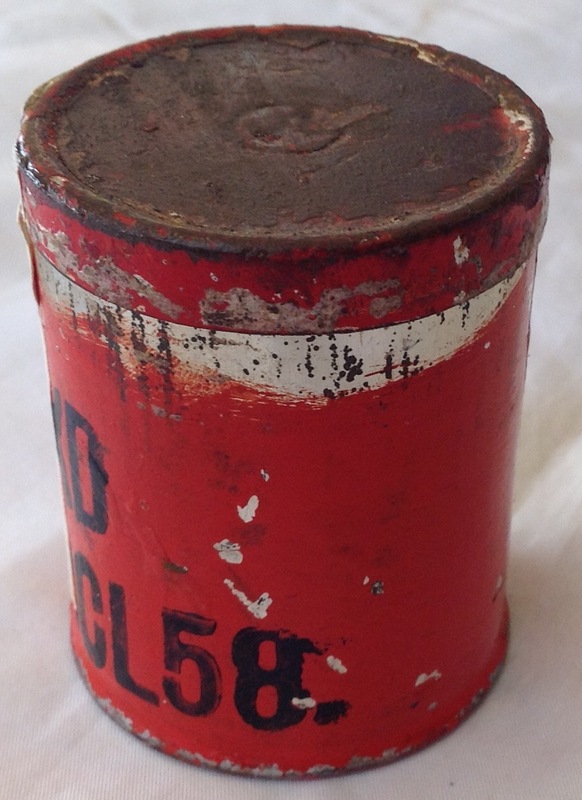 This entry was posted in British Army, Grenades, Post WW2 on December 19, 2017 by hatchfive. This entry was posted in British Army, Grenades, Post WW2, Weapons, WW2 on April 1, 2017 by hatchfive. The set must be handled carefully, holding by the fuze and cap chamber; it must never be struck or crushed and it must be kept away from heat and not allowed to become damp. No attempt will be made to strip down any part of the igniter set. 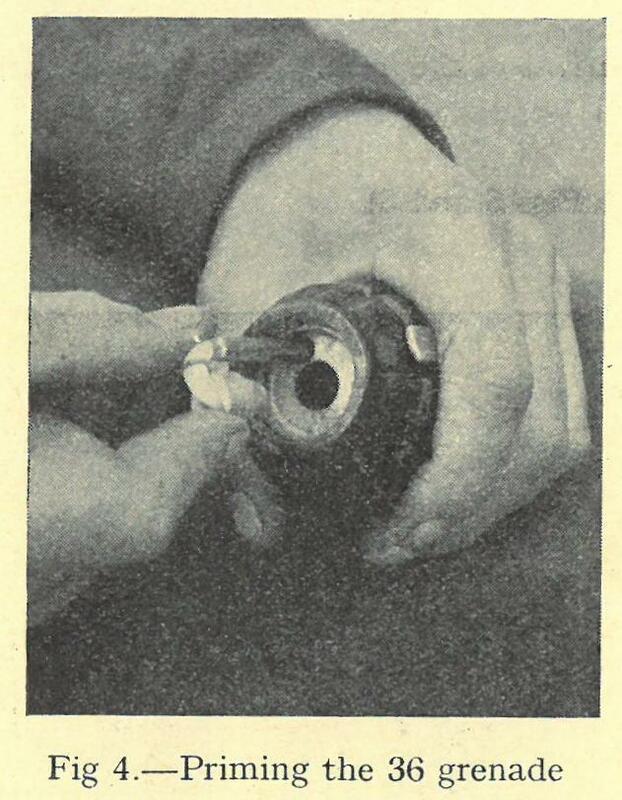 …to prime the grenade the base plug is removed; the detonator sleeve must then be inspected to ensure that it is free from any obstruction and has no rough edges. Holding the igniter set by the cap and fuze between finger and thumb, squeeze them very gently together to ensure that they will go into the grenade easily. 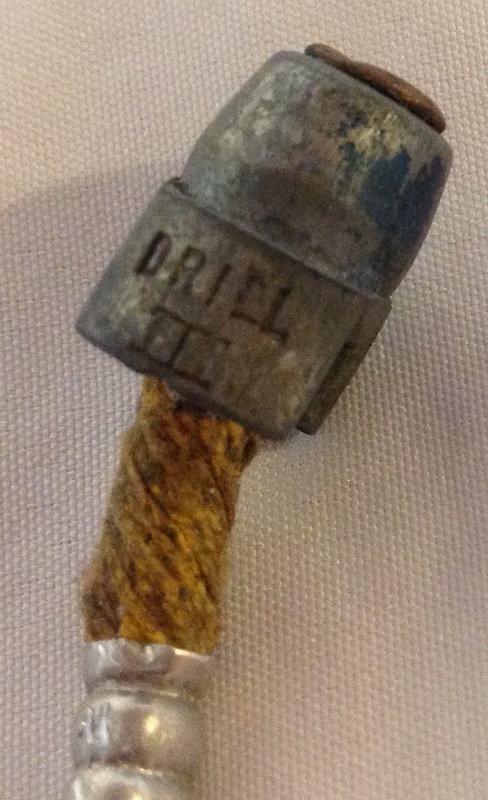 The detonator is then inserted carefully into its sleeve and the cap chamber pushed in as far as it will go. If for any reason the igniter set cannot be inserted easily into the grenade, both should be rejected. 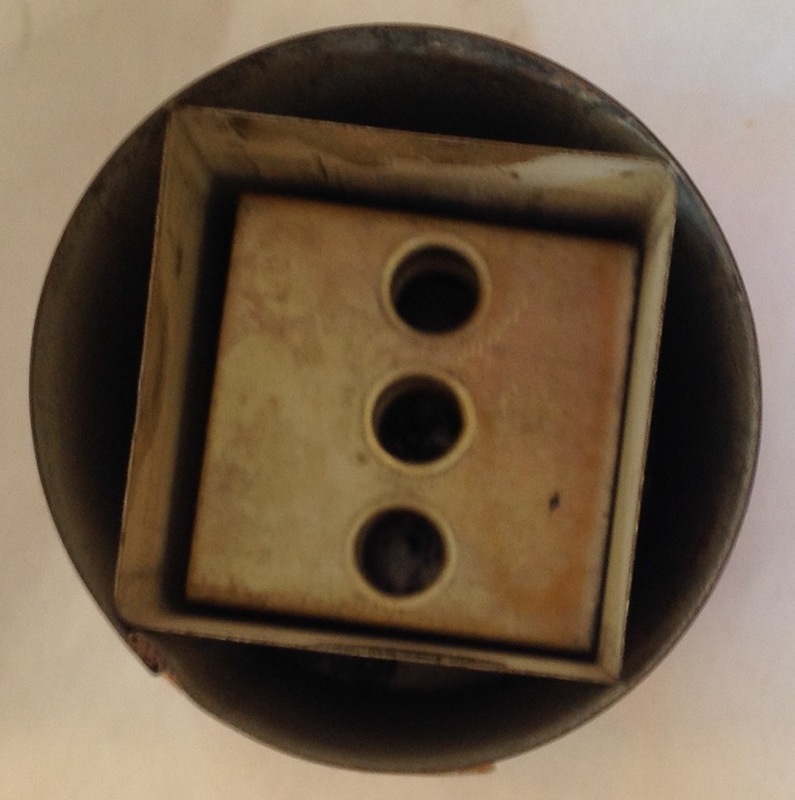 The base plug is replaced and screwed up with the base plug key. This entry was posted in British Army, Grenades, Weapons, WW2 on March 2, 2017 by hatchfive.